'Afghan Girl' From National Geographic Photo Arrested In Pakistan : The Two-Way Sharbat Gula was around 12 years old when her image became the most famous National Geographic cover in the magazine's history. She's now in her 40s. Sharbat Gula, subject of the famous "Afghan Girl" image, is in a Pakistani jail over alleged ID fraud. In 1984, Gula's brief encounter with photographer Steve McCurry, seen here next to images of Gula, led to a cover photo for National Geographic. Sharbat Gula, whose piercing stare and bright green eyes brought new attention to the plight of refugees fleeing Afghanistan in the 1980s, is now in a Pakistan jail. Gula was arrested in an investigation into identity-card fraud, local media report. Gula, who's also known as Sharbat Bibi, is facing a possible prison sentence after federal agents arrested her in Peshawar as part of an inquiry into forged national identity cards, according to the Dawn news agency in Pakistan. Peshawar's Central Jail has confirmed to NPR's Philip Reeves that Gula is being held there. Shahid Ilyas, an official from the National Database Registration Authority, told AFP that Gula could face seven to 14 years in prison if convicted. The case against Gula first made headlines in February 2015, when officials said she had used fake information — including a claim that she was born in Pakistan — to get a Computerized National Identity Card along with two men who said they are her sons. At the time, the case was referred to Pakistan's Federal Investigation Agency, which reportedly arrested Gula on Wednesday. Gula was around 12 years old when her image became the most famous National Geographic cover in the magazine's history. At the time, she was living in a refugee camp near Peshawar, Pakistan. Gula and other relatives had fled Afghanistan after a Soviet airstrike killed her parents — and her story resurfaced in 2002, when National Geographic photographer Steve McCurry managed to track her down. "For a young girl who was not only a refugee, but an orphan who was sort of anonymous — she really fell between the cracks of society there," McCurry told NPR last year. "We are doing everything we can to get the facts by contacting our colleagues and friends in the area. "I am committed to doing anything and everything possible to provide legal and financial support for her and her family. "I object to this action by the authorities in the strongest possible terms. She has suffered throughout her entire life, and her arrest is an egregious violation of her human rights." That sentiment echoes one on the Dawn news story, where the highest-rated comment reads: "Let that innocent lady live in Pakistan. She is no more Afghani now. She is Pakistani by soul and by heart. Let her be here. Release her." As recently as this summer, Pakistan was hosting nearly 1.6 million registered Afghan refugees, the U.N. Refugee Agency said. Many more refugees are believed to be in the country without documentation. Pakistan has been pushing to repatriate many of those refugees — and the U.N. agency has been facilitating thousands of returns, providing refugees $200 to help ease their re-entry to Afghanistan. 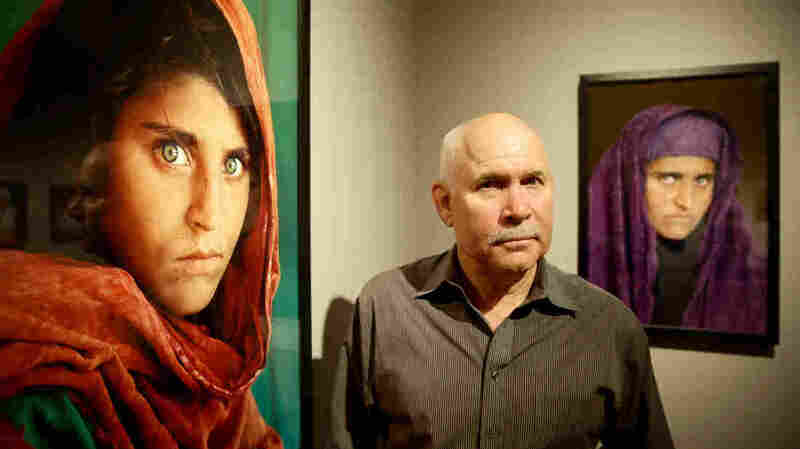 Now in her 40s, Gula has spent her life moving between Pakistan and Afghanistan, where violence and instability continue to rage, as McCurry learned when he met with her in 2002. At the time, she was around 30, married and the mother of three daughters. "Her life has been — since she left the refugee camp in '92, it's been relatively peaceful. She got married, had these children, living a traditional Pashtun life, in a village. It's been, thankfully, a bit uneventful."